Sue Minter addresses supporters Monday afternoon at Burlington's Main Street Landing. Vermont’s Democratic gubernatorial candidates spent their final day before Tuesday’s primary election rallying supporters, pressing the flesh and working the phones. “A lot of well-informed voters are undecided,” former senator Peter Galbraith observed Monday after canvassing senior centers in Burlington. Across town, rival Sue Minter said she’d detected a “shift” in the race to replace retiring Gov. Peter Shumlin as the party’s standard-bearer. The third major candidate in the race, former Google manager Matt Dunne, spent Monday hunkered down in his White River Junction office making phone calls, according to spokeswoman Jessica Bassett. She said he was not available for an interview. As the candidates reached out to voters one by one, their campaigns and supporters bombarded the state with television advertising and mailings. In the three and a half weeks since they last submitted comprehensive spending reports, Dunne’s campaign has spent more than $344,000 on mass media, according to filings with the Secretary of State’s office. In that same period, Minter has spent more than $313,000 on such expenses — including TV, radio, print, internet, mail and paid phone calls — while Galbraith has spent just $22,185. The last-minute blitz is likely to push both Dunne’s and Minter’s campaigns over the million-dollar mark — an extraordinary sum for a Vermont primary. Including all expenses made before the July 15 filing deadline and mass media spending since, Dunne has doled out more than $956,000. Minter has spent at least $910,000 and Galbraith $309,000. Those figures are likely to grow significantly as other expenses, such as payroll, are tallied. Such spending far exceeds that of Vermont’s last competitive gubernatorial primary. In 2010, Shumlin spent roughly $565,000 to best four opponents. Second-place finisher Doug Racine dropped just $255,000 that year, while third-place finisher Deb Markowitz spent $631,000. Dunne, who came in fourth, spent roughly a third of this year’s total: a mere $337,000. Driving the expense of this year’s race has been an infusion of out-of-state cash. Last week, Silicon Valley venture capitalist Reid Hoffman, a cofounder of LinkedIn and PayPal, spent $220,000 on independent advertising in support of Dunne. A super PAC founded by retired Vermont lobbyist Bob Sherman and largely funded by Washington, D.C.-based EMILY’s List spent more than $124,000 backing Minter. Another super PAC, affiliated with Vermont Conservation Voters, put $5,000 behind Minter. Galbraith, who has received no such support, said the voters he spoke with Monday were “appalled” at the influx of outside money. Minter dodged repeated questions Monday about whether she wished super PACs would refrain from supporting her candidacy. “What I wish is that we could overturn Citizens United, because it’s turned all of this into something that I think is getting further away from what our democracy is supposed to be,” she said, referring to the 2010 U.S. Supreme Court decision that gutted campaign finance laws. 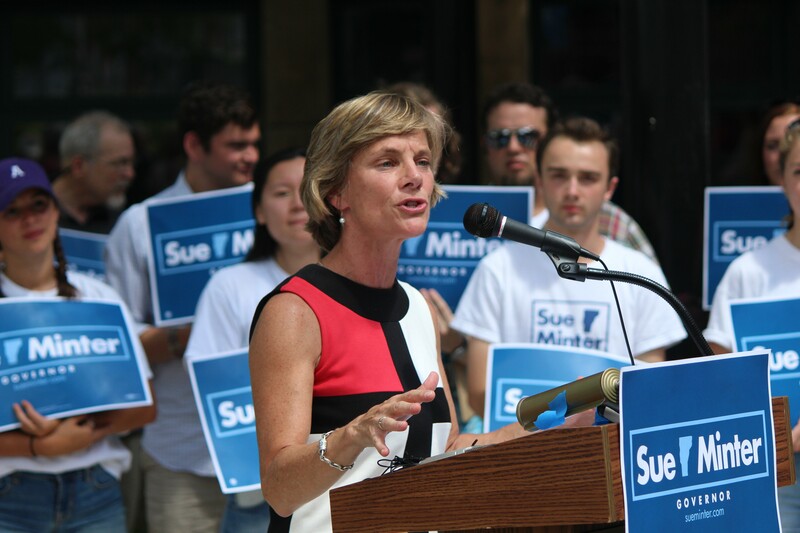 Minter was joined at her Burlington rally by several prominent politicians, including former governors Howard Dean and Madeleine Kunin, and nearly 50 other supporters. While Dunne held no public events on Monday, he planned to host his own get-out-the-vote rally Tuesday afternoon in Burlington’s City Hall Park. Headlining the event will be Jeff Weaver, who managed Sen. Bernie Sanders’ (I-Vt.) presidential campaign and endorsed Dunne a week and a half ago. Dunne’s campaign circulated a new op-ed Monday written by Weaver and making the case that Dunne was a natural choice for Sanders fans.